Spectrum plans another huge Warehouse Party this spring. Extra date added to Carl Cox’s ‘The Revolution’ show at Electric Brixton. Catch up with this weeks music based news… We bring you the most up to date news from labels, venues, promoters to DJs and lots more! This weeks goodies up for grabs…. 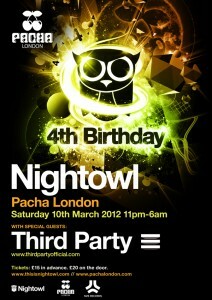 On the 10th of March, Nightowl celebrates it’s 4th birthday with guests Third Party at Pacha. 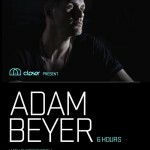 Previous guests include Bingo Players, Hardwell and Kim Fai. Latest reviews of releases coming your way! Bootlegger with Nisekay, Kozber, Karina at ? In the blog this week: Andrew Weatherall, A Guy Called Gerald, Sci+Tec’s Minicoolboyz, Nina Kraviz, Kissy Sell Out, Jimpster, Isolee, Freerange, Culprit – Droog + More! This wk: Sonar, Cavo Paradiso, Shonky, Sven Vath + the Top 5 nights out this weekend!